The pay claim for local government workers is for a minimum increase of £1 an hour on scale point 5 to achieve the living wage and the same flat rate increase on all other scale points. A pay freeze and eight years of below-inflation pay rises since 1997 mean thousands of local government workers, from across the pay scale, are struggling to make ends meet. Over half a million, mostly women, mostly part-timers, earn less than the living wage. 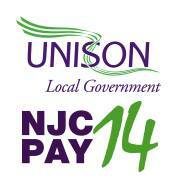 Only in local government and local authority schools are large numbers of public sector employees paid so poorly. Party leaders, ministers and MPs from all parties are calling for a higher national minimum wage or the living wage. If leading politicians are focussing on the role decent pay can play in raising living standards, surely what is good for other workers should be good enough for those working in local government. Many local government workers rely on benefits to pay bills. The taxpayer is subsidising local government to pay poverty wages. Paying all local government workers a living wage will boost Treasury coffers by around £900 million every year from increased tax and national insurance take – shifting many off in-work benefits. Outside London, most local government workers live and work in the same area. Every £1 spent in the local economy generates a further 64p for the community. Paying local government workers a rise of at least £1 an hour will boost local businesses. Paying the living wage will enhance the council’s reputation, boost morale and improve productivity. Living wage employers report better retention of staff, improved service, and a reduction in absenteeism and reduced recruitment costs.